Ingredients To marinade lamb 4 medium size lamb leg steaks 2 tablespoon butter 2 Tbsp olive oil Salt and black pepper to taste A dash or two Tabasco sauce 1/8 Tsp nutmeg ground Piri Piri sauce, warm in microwave To make potatoes, green beans and carrots 4 baby potatoes, wash and cut into half 200 g green beans, remove stems, and wash 4 small carrots, wash, stem and top removed a bit Water A pinch of salt pepper To make pickle radish Prepare this one or two days in advance as you wants it to be sweet/ sour pickles taste; refrigerate up to 3 weeks in an air tight glass container 3 medium radish (white carrots), washed, cut stem, peel skin 5 Tbsp salt, extra 5 Tbsp sugar, extra to sweeten a bit 1/2 -1 lemon juice 7 Tbsp apple cider, extra Method Two days earlier Cut the radish thinly; use food processor or with knife. Soak in salt for 45 mins until juices come out. Squeeze dry with a tea towel. Then add sugar until juices comes out. Squeeze it again, make sure its really dry. Then add lemon juice and apple cider. Season as you mix them checking the taste is just right pickle, sweet/sour. The present day Pre heat oven 180 deg C. Bring water to boiling hot, marinade leg of lamb and refrigerate for 30 minutes. Pour boiling water into a microwave save dish with potatoes. Microwave using 1200 watts, par boiled potatoes. Meanwhile, bring out lamb to room temperature. Prepare beans and carrots in another microwave dish, put in microwave to cook about 8-10 minutes. Remove beans set aside keep warm with foil. Add 4-6 minutes more for carrots. Removed carrots and distribute beans and carrots into 4 plates and keep warm. Place lambs and potatoes in lined with foil baking tray and baked for 25-35 minutes until potatoes are cooked through golden, check meat during the time, turn them over rotating the tray as well. If you want medium rare, removed earlier about 5-7 minutes. This time I wanted well done meat. Removed them and set aside for 5 minutes. Meanwhile warm the vegs in the hot oven with door close for 5 minutes. 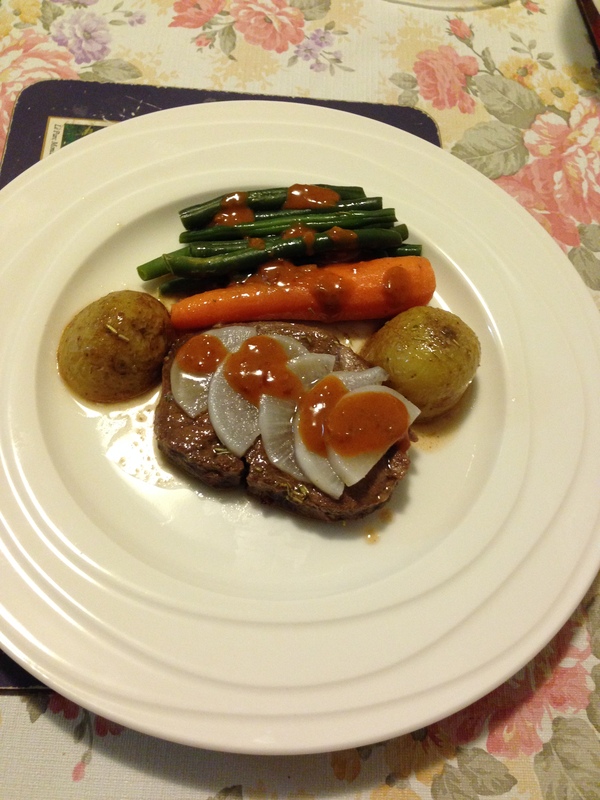 After time rested, plate the lambs and potatoes in the warm plate with vegetables. Place a few pieces of pickles on top of meat and drizzle piri piri sauce on top. Serve well with Merlot/Shiraz wines.